Discussion in 'Workshop - DIY - Do it yourself' started by VogueParisLover, Jul 8, 2009. Hi everybody! I'm not sure if this is the right place to post this but... 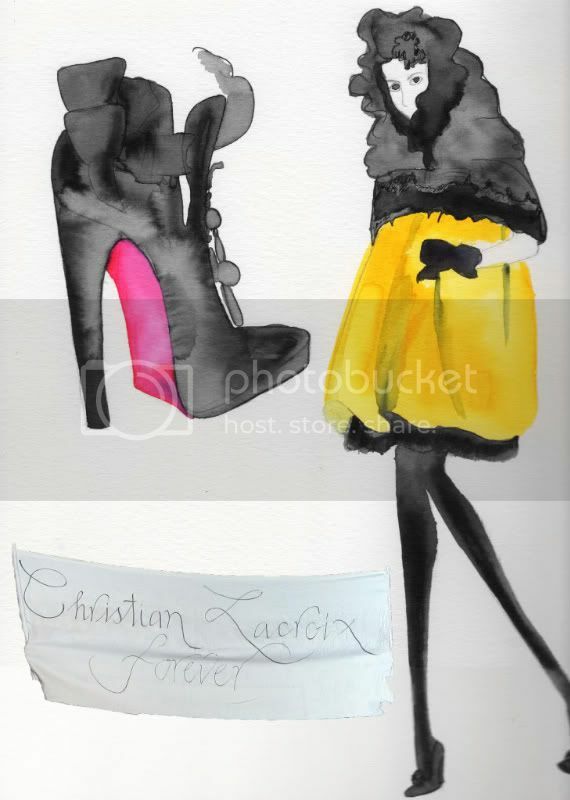 I was just thinking about making an illustration as a tribute to Christian Lacroix because his last couture collection might be his last. And then I started thinking about all of the talented people on tFS who can write, draw, and design. What do you guys think about making individual tributes to Lacroix with your talents? Any ideas? Do you mean to actually send to Lacroix? ^ I guess not, just to make and showcase here, but we could send them if anybody wanted. To have people showcase their creativity and express themselves about Lacroix. What do you think? I'm glad you guy's like the idea. I have already started mine. Me too! I've already done one look Spring 2007. I think it looks good. should we set a time frame like try and compile everything in 2 weeks so everyone can try and do good work? okay I'm in too, I want to make something. It's a great idea, and I think it's even greater to send it! I'm looking still not sure if i wanna do a portrait of Lacroix or a painting of some of his work...uhm...what do you think? I don't want to sound egocentric but i'm quite good at portraits so i thought it would be a good idea to send it. By the way, if we are going to send it: are we going to put in our letters something like "From The fashion Spot Members" or something like that? I don't think we could send it all together so everyone will have to send their own work individually, but we could say we are all from the same forum and that we are sending it as a collective tribute. ^ I think a portrait would be great. I'm sure it'd be really good. But you should do whatever you feel that you can do best. And I think that we shouldn't send it all together because that would be very hard to do, but we could each right a note in the packages we send that say we are all from the same forum and etc. Who should we send it to? I dont want it to get discarded or I might email mine Im not sure what to do. Any ideas? Anyone knows if this address is correct?